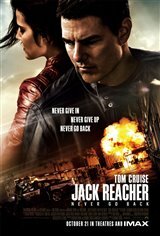 Set four years since the events of the first film, Jack Reacher (Tom Cruise) returns to the headquarters of his old military unit to visit Major Susan Turner (Cobie Smulders), with whom he's kept in touch by phone. To his dismay, he discovers she's been arrested for espionage. Believing her to be innocent, Jack must break her out of prison not only to save her life, but in an effort to discover the truth. Meanwhile, Jack is framed for the murder of a Colonel, and also discovers he may have a 15-year-old daughter named Samantha (Danika Yarosh). However, the girl's connection to him puts her in danger, so he goes on the run with the girl and Turner, as they uncover a conspiracy that is bigger than all of them.